Zandvoort is a great place to see some quality street entertainers, especially during the high season when tourists flock to Zandvoort for the beach and Summer special events programme. 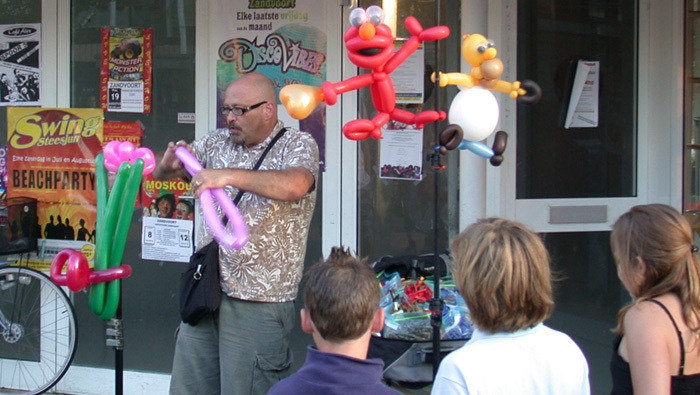 The street entertainment in Zandvoort usually takes place in and around Kerkplein at the bottom of Kerkstraat. The street entertainers themselves come from all over the world such as musicians from South America, cartoon artists from around Europe and even specialty acts from across the Atlantic. Balloondog Mike Dada shown in action comes from Vancouver and is a good example. The photo of him here was taken in the summer of 2009 in Zandvoort’s Kerkplein. A crowd gathered around him and watched with fascination as he made all manner of balloon creations. We filmed him making a Minnie Mouse and a Scooby Doo – 2 very different characters yet so well done. Balloondog Mike claims he can even make balloon creations of Elvis Presley and Michael Jackson! Watch the videos to see Balloondog Mike creating Minny Mouse and Scooby Doo. Brilliant entertainment!